RESPONDENTS: Secretory, Federal Education & Professional Training Division. Islamabad. (it) Director model Colleges. Federal Directorate of Education, Islamabad. Secretary of Finance (Regulation wing). Islamabad. 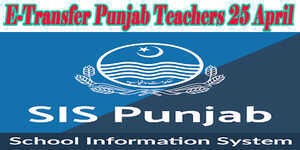 Before- Mr. Sikander Ismail Khan. And Mr. Manzoor Ali Khan. Members. Present' Mr. Ghulam Rasool Bhatti. Advocate for the appellant. Mr. Arshad Mehmood Malik. Assistant Attorney General with Rana Muhammad Nom DD, FDE (Legal) and Mr. Arshad Anjum, AD, Federal Education Professional Training Division. Dirs. 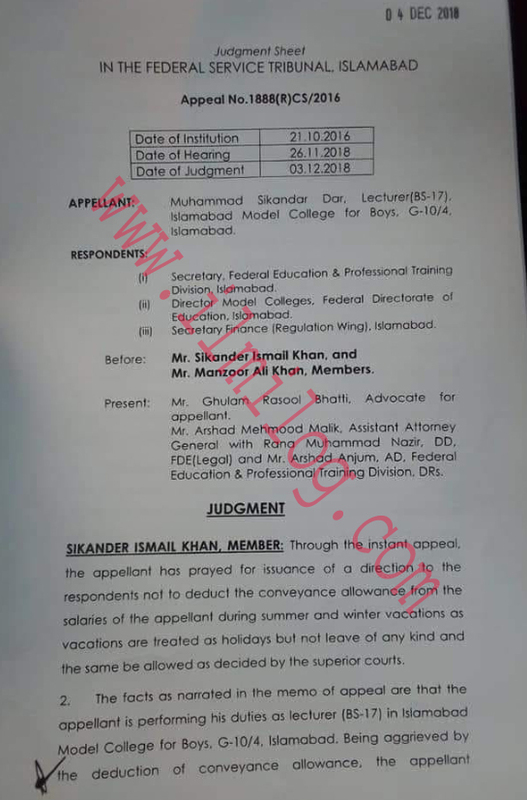 SIKANDER ISMAIL KHAN, MEMBER: Through the instant appeal, The appellant has prayed for issuance of a direction to the respondents not to deduct the conveyance allowance from the salaries of the appellant during summer and winter vacations as vacations are treated as holidays but not leave of any kind and the same be allowed as decided by the superior courts. 2. The facts as narrated in the memo of appeal ore that the appellant is performing his duties as the lecturer (BS-17) in Islamabad Model College for Boys. G-10/4. Islamabad. Being aggrieved by 1i/he deduction of conveyance allowance. The appellant preferred deportment representation dated 22-06-2016 has been responded. Hence this appeal. 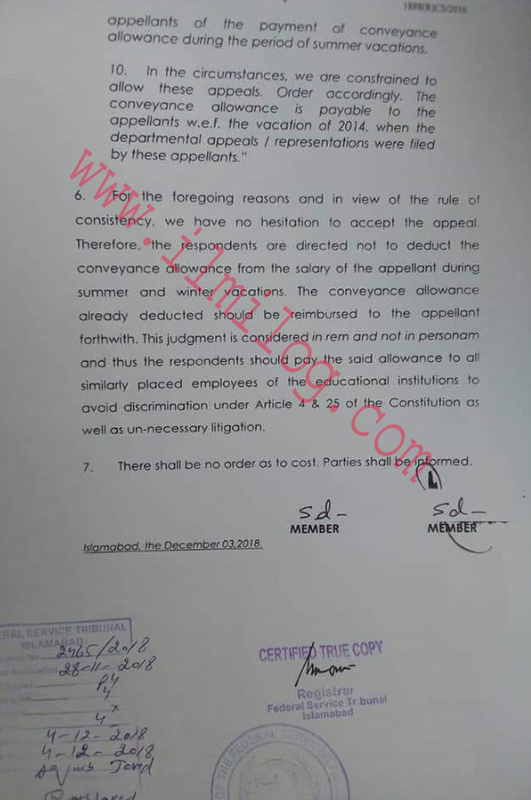 The learned counsel for the appellant has argued that traveling allowance and conveyance allowance is part of compensatory allowance with means an allowance granted to meet the personal expenditure necessitated by the special circumstances in which duly Performed. Further, in an identical matter, the Hon'. 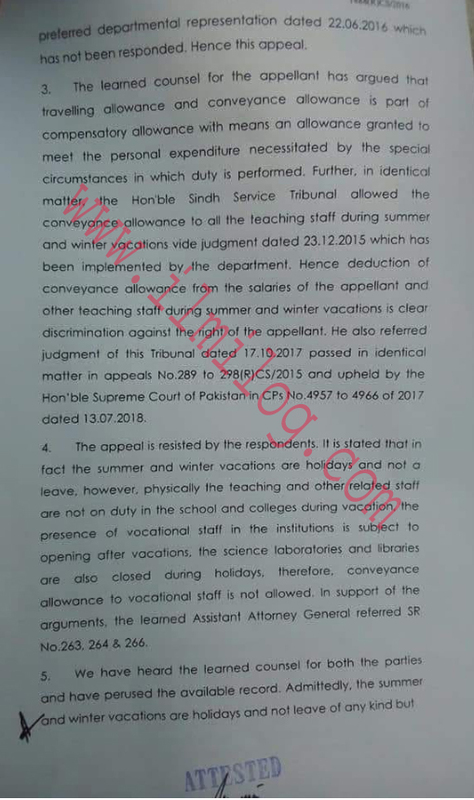 Sindh Service Tribunal allowed the conveyance allowance tail the teaching staff during summer and winter vocations vide judgment dated 23.12.2015 which has been implemented by the department. 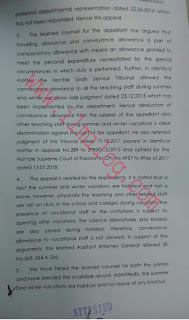 Hence deduction of conveyance allowance from the salaries of the appellant and other teaching staff during summer and winter vacations is clear discrimination against the right of the appellant. 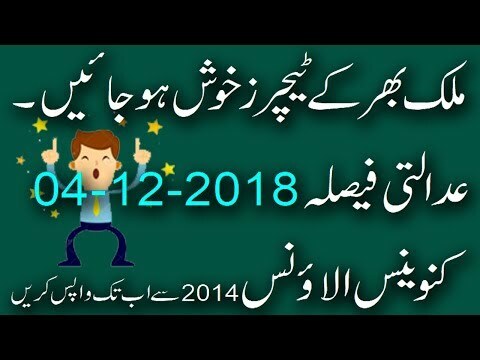 He also referred judgment of this Tribunal dated 17.10.2017 passed in an identical matter in appeals No.289 to 2981R) CS/2015 and upheld by the Hon'ble Supreme Court of Pakistan in CPs No.4957 to 4966 of 2017 doted 13.07.2018. 4. 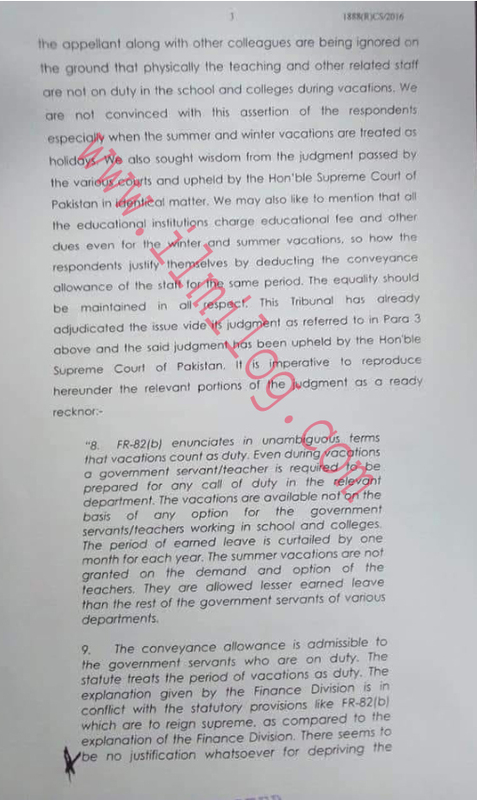 The appeal is resisted by the respondents is stated that in fact, the summer and winter vacations are holidays and no leave, however, physically the teaching and other related staff ore not on duty in the school and colleges during vacation. 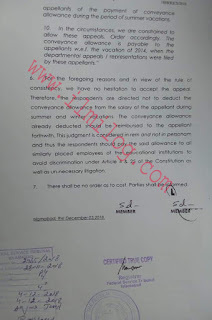 The presence of vocational staff in the institutions is subject to opening after vacations, the science laboratories and libraries are also closed during holidays, therefore, conveyance allowance to vocational staff is not allowed. In support of the arguments. The teamed Assistant Attorney General referred SR No.263. 2646 266. 5. We have heard the learned counsel for both the parties and have perused the available record. Admittedly, the summer and winter vacations ore holidays and not leave of any kind.